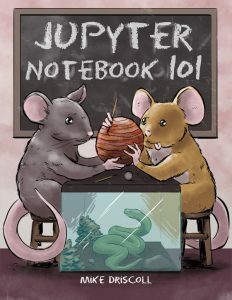 There’s only two days left to join the Kickstarter for my latest book, Jupyter Notebook 101. It’s also one of the best times to help out as you get to help shape the book right now. I always take my reader’s feedback when writing my books into consideration and have added lots of extra information in my books because of their requests. The table of contents are liable to change in content or order. I will try to cover all of these topics in one form or another though. I am also looking into a couple of other topics that I will try to include in the book if there is time, such as unit testing a Notebook. Some of my backers have also asked for sections on managing Jupyter across Python versions, using Conda and if you can use Notebooks as programs. I will look into these too to determine if they are within scope for the book and if I have the time to add them. This week we welcome Matthias Bussonnier (@Mbussonn) as our PyDev of the Week. Matthias is a core developer of the Jupyter Notebook and IPython. You may want to check out his Github profile to see what projects he is interested in and working on. Let’s spend some time getting to know Matthias better!